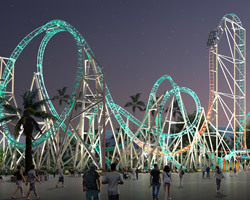 Knott’s Berry Farm will welcome HangTime, a brand new steel roller coaster - and the first dive coaster on the West Coast - to the theme park during the 2018 summer season! 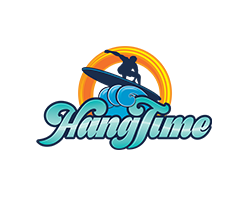 Enjoy an entire season of fun, including the thrill of HangTime, a brand new steel roller coaster opening summer 2018, with a 2018 Season Pass. Knott's Berry Farm Season Passholders receive complimentary overnight parking when booking direct! A valid Knott's Berry Farm Season Pass is required at check-in. 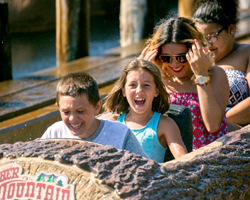 To view Season Passholder rates, click here or enter promotional code SEASONPASS. We will be conducting an emergency plumbing service from 12:00am to 5:00am. Water will not be available during this time. When will I receive my Package tickets? Tickets included in a Hotel package will be printed and provided on the day of arrival. If planning on going to the Theme Park on the day of arrival, tickets may be picked up as early as 9 am. When can I use my Package tickets? Package admission tickets are valid for the day of arrival, day of departure, or anyday in between. How many Package tickets will I receive? The amount of tickets depends on the amount of Adults and Children entered at the time of booking. How much does Parking cost at the Hotel? For stays in 2019, parking is $10.00 per vehicle. Parking is included with Hotel Packages or when booking direct with the Season Pass rate. Yes, all rooms feature complimentary wireless internet. 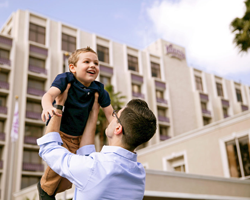 Does Knott's Berry Farm Hotel offer transfer service from any airports? No, Knott's Berry Farm Hotel does not currently offer shuttle service to or from any airports, many guests utilize services such as Karmel Shuttle to get to the Hotel. Prices and availability may vary depending on the service selected. How do I add the Camp Snoopy Room option? Camp Snoopy rooms are specific room types. Select the Camp Snoopy room at the time of booking or contact Reservations at 714-995-1111 to modify your existing reservation. Is there a microwave available? No, Knott's Berry Farm Hotel does not offer microwaves. No, pets are not allowed in the Hotel. Service animals are welcome. A service animal is defined as a dog or miniature pony that has been individually trained to perform tasks for a person with disabilities. We may ask you what task your service animal performs for you. Service animals must be controlled with a “restraining device” at all times while on our property. There is a limit of one service animal per guest. We are not permitted to take control of your service animal.